Super Bowl LIII--a great opportunity to drink craft beer, eat, and win prizes! We will debut a new beer (A Pale Ale), have a special Super Bowl menu & chances to win prizes throughout the game! Mic Drop--Back by popular demand! Email bosciaemail@gmail.com if you are interested in telling your story! 15 minutes long, send a brief outline and any questions you may have. Mic Drop: Island Storytelling Series--Tell Us Your Story! Island residents, storytellers, comics, and musicians telling 15 minute tales about island life. When: Friday evenings, 7pm-9pm November 16th and 30th. December 14th and Special Holiday show December 28th. Where: Vashon Brewing Community Pub. Vashon Island, WA. Beginning in late Fall, we will be presenting our semimonthly "Mic Drop" series. 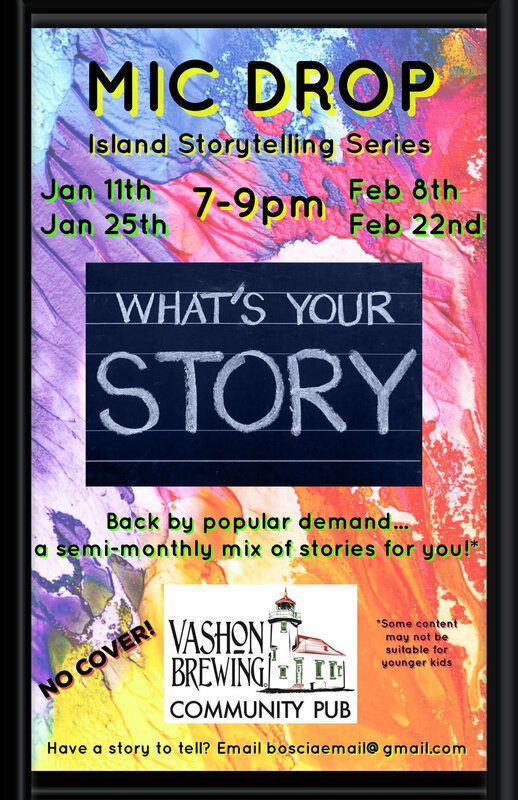 Each night we will feature a group of Vashon Island residents telling their own short stories. A mix of professionals, comics, and first time story tellers will be itching to tell you their tales. Some may be funny, others thought provoking or heart breaking, but all will be certain to entertain you while you sip on your favorite Vashon brews or wines and nibble on our delicious pub bites. Local performers ready to tell their stories already include Tami Brockway Joyce, Chuck Roehm, Richard Franklin Moore, Leila Khatapoush, Sarah Howard, Truman O'Brien, Kelvin Goliday and many more. Have a story to tell? Want to make us laugh or cry? Have a Vashon tale that no one has ever heard? Contact Chris Boscia with any questions, or email your brief outline of a 15-20 minute story to BosciaEmail@gmail.com and we will contact you about formatting and dates. Beginning Nov 11th, we will be open 7 days a week! Weekdays (Mon thru Fri) we will be open from 4pm until 9pm, and weekends will not change: Noon to 9pm. Take a look at our Event Calendar page to see what we have going on! Saturday Sept 22nd--the first day of the traditional celebrations in Munich--we will be hosting our first annual Oktoberfest! There will be live music, delicious German influenced food, fun activities for all....and of course: BEER!!! We will be debuting a few new German style craft beers on this day. Kids entry free--$5 adults 21+--$15 includes a commemorative Oktoberfest beer mug! Ever since we started the brewery, the question has been when are we going to open a tasting room? WE ARE FINALLY DOING IT! Instead of a tasting room, we are calling it a Community Pub. Why? We want this to be a space for the whole community, whether you like craft beer or not. We'll be serving only Vashon produced beverages (Beer, kombucha, wine, hard cider & perry). Partnering with a local restaurant and using island grown & produced ingredients where possible. Brewing our beer with island grown barley custom malted for us in Eastern WA. Creating a public space open to groups to meet and hang out, including families with kids! WHERE IS THE COMMUNITY PUB LOCATED? 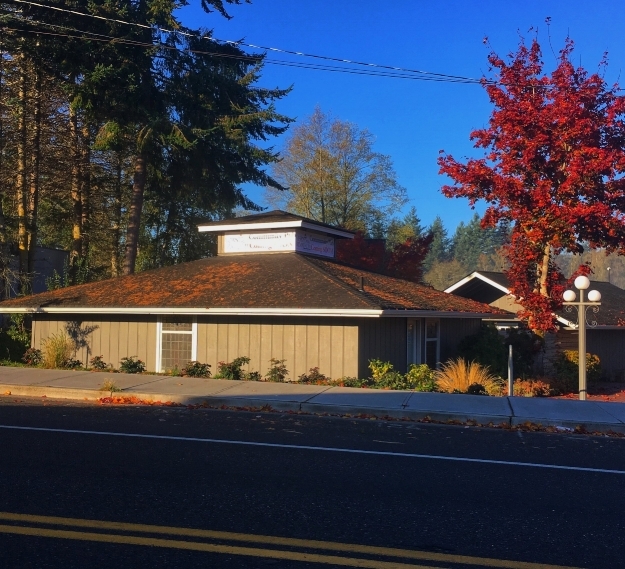 The pub will be located across from the Vashon Public Library at Vashon Village (17205 Vashon Hwy SW). Indoor and outdoor seating will be available. There is a parking lot to park in, as well as additional street parking. ADA accessible. WHEN EXACTLY IS IT OPENING? We hope to open Spring of 2018. Be sure to sign up for the latest news in the Community Pub tab to find out the exact Grand Opening date, and follow us on Instagram @vashonbrewing for other updates! Vashon Brewing Preview Party at Lodges on Vashon! It's official--Vashon Brewing is set to open our version of a tasting room next Spring 2018!! It will be a lot more than just a tasting room. We are calling it the Vashon Brewing Community Pub. A place to foster community and celebrate the many local beverages and tasty food sourced from the island. To celebrate, we are hosting a preview party at the Lodges on Vashon. We'll be introducing many of the local artisans helping us to make this a reality, serving lots of great beverages, and serving a 6 course meal to give you a fun preview of what's to come. Join us!. We've been working with a local farmer to grown malting barley for a couple of years. Today, we started harvesting the first crop! It's a noisy, dusty, smelly job, but we harvested our first ton of grain today, with much more to harvest tomorrow and the next day. After that, it gets shipped to LINC Foods in Southeastern Washington for malting, and will eventually wind up in our beer. We have switched to a new bottling system! We pre-fill the bottles with CO2 and they fill under pressure to ensure your beer stays fresh and carbonated longer. We are using PET plastic growlers that are food safe, reusable, and, unlike glass, shatterproof, highly recyclable, and able to store carbonated beverages without leaking beer or losing pressure. A few of our employees expressed some concern about using plastic. Cliff (the brewmaster) never does anything without thoroughly researching it first--he discovered that the recycling systems in place for glass are expensive and inefficient--resulting in the majority of glass ending up in the landfill anyways! If your worry is about plastic also ending up in the landfill, we share that worry, however, if you continue to recycle (or the best option--simply REUSE! ), this material is much more likely to actually be recycled. Another advantage is that it will not break, and it holds the carbonation much better! That is a little more background for why we have made this change. The inspiration for our Solstice Stout is the several miles of very dark roads lit by luminaries on Vashon Island each Winter Solstice night. Thousands of luminary candles in paper bags magically appear on Vashon, lighting the way of many people driving with only their parking lights or no lights at all. It's an amazing sight, helping us to celebrate the winter, and remind us that longer days are ahead.